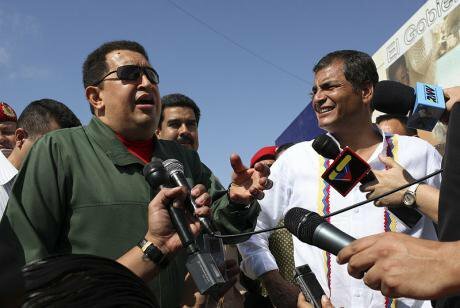 Rafael Correa wit former Venezuelan president Hugo Chávez. Wikimedia Commons. Ecuador President Rafael Correa was an icon of Latin America’s pink tide. The self-proclaimed socialist was a fervent advocate of the Bolivarian Revolution and a close ally to Venezuela’s President Hugo Chavez. He ran a government program called “the Citizen’s Revolution” (Revolución Ciudadana) focused on social justice and development. But the Revolution had its eyes on the oil and turned sour all too soon. It was a promising start. Correa was elected in 2006, re-elected in 2009 after a Constitutional Reform, and elected a third time in 2013. His self-made party Alianza Pais gained strong electoral support, secured a majority in Congress and benefited from the most profitable oil boom in Ecuador’s history. But the pink tide was not as rosy as expected. Censorship boomed, labor rights were restricted, and social protest was criminalized. The Citizen Revolution was not media friendly. Correa attacked journalists, took them to court, had them fired. Investigative journalists faced million-dollars lawsuits for denouncing corruption, newspapers were sued for their editorials, and cartoonists were taken to court for “inaccurate” humor. The authoritarian turn meant repression of any form of opposition to the government. The 2008 repression of a small protest in Dayuma, Amazonia, was a presage of the years to come. Some of the most infamous cases include the Ten of Luluncoto, ten university students jailed for over a year on fabricated charges of sabotage for discussing the rights of nature (with nothing less than a book by Che Guevara as evidence). The Six of Cotopaxi was a group of university professors and administrators jailed for defending academic autonomy. At the Mejia public high school, in Quito, student demands were met with a brutal police intervention with tanks and torture on school grounds. The defense of territories and water rights was framed as terrorism. The Shuar leader Pepe Acacho and Pedro Mashiant were sentenced to 12 years in jail for “organized terrorism” after leading peaceful protests against the 2009 Water Law. Carlos (Yaku) Pérez Guartambel was jailed for “altruistic” terrorism for defending water rights against gold-mining in the highlands of Kimsakocha in 2010. In 2014, the anti-mining activist Javier Ramirez was illegally arrested, then sentenced to 10 months in jail on ambiguous charges of rebellion, sabotage and terrorism for resisting a state-owned mining project in Intag. In 2013, Decree 16 further stifled civil society. It forbid organizations engaging in “political activities” to receive any international funding- a strategy to cut short the support to indigenous and environmental organizations. It forced all non-profit organizations to register with the government and required all administrative acts to be supervised by a government delegate. Decree 16 was used to dissolve organizations like the Pachamama, an NGO with 15 years of advocacy work in Amazonia, and the historic National Union of Educators, created in 1944. Ecuador’s authoritarianism was possible because Correa took over of the justice system. The Revolution tailored the judiciary to its needs by creating the Judicial Council, a supposedly independent mechanism that was de facto managed by Correa. Starting in 2011, a process of “restructuring” the courts fired judges, many accused of “inexcusable errors,” and arbitrarily appointed new ones. Correa’s party had a comfortable majority in Congress. He often governed by decree, creating for instance the infamous National Secretariat of Intelligence, SENAIN (2009-2108), an agency accused of espionage, surveillance and persecution of political opponents, journalists, and activists. Correa also controlled Ecuador’s National Electoral Council (CNE), which was recurrently accused of fraud, lack of transparency, and from blocking political opponents from running in elections. Overall, 850 activists were criminalized under Correa’s regime, and political opponents endured ruthless persecution. In the 2014 landmark Yasuni case, the CNE was accused of invalidating hundreds of thousands of signatures to impede a popular referendum to stop oil drilling in the Amazon’s Yasuni Nature Reserve. A Congressman from the Indigenous party Pachakutik faced an order of arrest for “insulting” the president (and spent a year into hiding), another was beaten to the ground as she entered Congress, and Galo Lara was jailed without trial on fabricated charges for denouncing corruption. General Gabela died in shady circumstances after denouncing government corruption. Claims to justify Ecuador’s authoritarian turn with economic rights- as if there was a trade-off between political and social rights- fell short and the Citizen Revolution broke many of its socio-economic promises. Correa won elections with the promise of industrialization, the Latin American way out of underdevelopment and dependency on commodity exports, but the transition from exporter of primary products to a knowledge economy never happened. Correa did revamp his own version of Import Substitution Industrialization policies, mainly centered in a long list of tariff-protected items along with another list of exemptions by 2009. Industrial policy had become a list of national champions that changed as often as the ministers in charge of the different versions of the same policies. Much cherished industrial policy has not progressed beyond wonderful power point presentations displayed in impressive white elephants like the Yachay University. The other central promise to the progressive agenda was that of a welfare state. Latin America’s pervasive inequality is a testament to that absence. Ecuadorian citizens were eager to vote for a progressive government universalizing a system of public health and education for all, after so many years of austerity and restrictive social spending. The reasons were obvious: it has an immediately equalizer effect both, in terms of quantity of people covered –including and especially the middle class- and the quality of services provided so, that all citizens have similar opportunities. Even when multicultural and affirmative action programs are taking into account, the socialization and optimization of social safety nets is what actually sets apart the most equitable countries on earth: Norway, Finland and Sweden. Paradoxically, President Correa did not stir the country in that direction. He followed in the footsteps of populist Latin American presidents –conservative or progressive alike- that only increased spending on targeted programs, without universalizing access or improving the quality of the system, leveling the playing field for the impoverished ones without making them clients. Social expenditure was at 4.2% of the GDP by 2016, the amount had more than double to 9.4% of the GDP, according to Ecuadorian System of Social Indicators, SICSE. Nonetheless some progress was made. Public expenditure in education -as a percentage of GDP- went from 2.8% in 2006 to 3.9% in 2016. Investment in public health grew at a lower rate but grew nonetheless, from 1.2% of the GDP in 2006 to 2.8% at the end of the decade. It was a remarkable achievement in and of itself. The oil boom allowed him to ramp up social expenditure steadfast, especially the first five years of his mandate. Once the economic downturn set in, most of the initial investment became idle and incapable of sustaining the initial rate of provision. However, the amount and pace of social investment do not tell the whole story. Significantly, investment was directed at building new infrastructure either hospitals or new schools and impressive building for new public universities. The central problem was that the long-awaited educational reform in the country became another authoritarian exercise of power imposed from the top. National experts on education were ignored and the national teachers’ union vanished from policy-making. Indigenous bilingual education was terminated, leaving thousands of children in rural Ecuador without local schools, and the indigenous university Amawta Wasi was closed for not fitting the standardization of the education reform. No Neoliberal government had dared to forfeit such achievements from a historically oppressed minority as the supposedly progressive Citizens’ revolution did. The reforms touched every aspect of public and private education, from sudden curriculum changes for secondary to drastic interventions in public and private universities that failed the scorecard imposed by the government. Astonishingly, Correa’s administration did the opposite of what everybody was at the very beginning: radically improved the quality of primary education to make it compulsory and accessible for all, erasing the existent radical disparities between education for the rich and middle-upper classes and the rest. Instead, the majority of resources went to finance tertiary education as opposed to primary and secondary education, reversing the historical path followed by most successful OECD countries. In 1986, 46.7% of all public investment in education went to primary school and only 17% to tertiary education. By 2016, 23.2% was going to primary and 43.5% to tertiary education. Labor rights did not fare much better. Labor unions did not gain support under Correa’s Revolution; instead its leaders were attacked or censured from discussing labor reforms. Trade union membership did not improve over the decade either. If anything, its capacity to bargain for better salaries and working conditions deteriorated even within the state where unionized bureaucrats were subjected to forced “resignations” in mass when Correa’s administration decided that political appointees were preferred for technical positions. Poverty reduction did happen; it declined from 37.6% to 23.3%. However, poverty declined even faster under neoliberalism between 2000 and 2006 from 64.4% to 37.6%. The economy had significantly slowed down in the face of increasing instability creating by serious allegations of corruption, slandering of public resources while the national budget tripled in less than ten years. Meanwhile, the economy had significantly slowed down in the face of increasing instability creating by serious allegations of corruption, slandering of public resources while the national budget tripled in less than ten years. Correa left the country in a recession trap, with suboptimal annual rates of growth underperforming all the rest of fellow Latin American economies with the exception of Venezuela and Haiti, according to ECLAC. Like elsewhere in Latin America, Ecuador’s New Left invoked the end of dependency and narratives of national sovereignty. As such, one of Correa’s first steps was to shut down the US military base in Manta, celebrating the recovery of sovereignty. He detached the country from World Bank conditional loans, declaring its representative in Ecuador persona no grata. Yet sovereignty claims were quickly sidelined when it came to licensing territories to extractive industries or taking credit loans from China. Since macroeconomic policies were not part of the equation, the Revolution went for oil. Oil, a key asset of the Citizen Revolution, came to represent over 90% of Ecuador’s exports. Oil profits between 2007 and 2013 represented more than 50 % of the total income generated in the country’s entire history since drilling started in the 1970s. The unprecedented oil boom led to unprecedented levels of corruption. As he stepped into office, Correa bought the support of the military by giving them control over the national oil company PetroEcuador. Then, oil was used to get quick quash. The Panama Papers revealed that Petroecuador obtained a billion-dollar loan from PetroChina in exchange for 69.12 million barrels of crude in 2009, delivering 2.88 million barrels per month at 7.25% interest. It was an international speculative game: Correa’s regime pre-sold oil reserves to China in exchange for immediate access to credit; China re-sold the oil in global markets for a higher price. In the process, Ecuador's government officials made millions in “commissions” that ended up in fiscal paradises. These oil deals tied Amazon oil for decades to come. The Yasuni Reserve was licensed to oil drilling to pay back Chinese loans, compromising one of the world most biodiverse hotspots that is territory of the Tagaeri and Taromenanis, two Indigenous peoples in voluntary isolation. By giving barrels of oil to China in loan payments instead of selling them on the open market, Ecuador, which is on the US dollar system, grew desperate for fast cash. China became Ecuador's largest creditor, providing at least eleven loans totaling over $15 billion since 2010. Ecuador was left with gargantuan debts to China under draconian conditions. Much of today’s debt are anticipated sales of oil exports with high interest rates; future oil exports are already compromised to China. Many infrastructure projects were Chinese loans were channeled under strict conditions of “buying Chinese” with little or no room for actual opportunities to boost national industry. In addition, the overspending spree under the guise of Chinese investment has negatively impacts any future industrial policy and has lasting consequences for social programs and the real possibility of an Ecuadorian welfare state. The reliance on oil to secure fast cash expanded the extractive frontier without environmental standards or prior consultation of indigenous peoples, provoking many social conflicts. The goal was to drill Ecuador’s way into development, and those who resisted were accused of being “beggars sitting on gold” delaying the nation. This urge for natural resources accentuated colonial dynamics of land dispossession. During his decade in office, Correa doubled the license to extractive industries, which passed from 6% to 12% of national territory. There was never prior consultation: ancestral territories were licensed to multinational corporations, especially from China, without respecting constitutional and international collective rights to inform and consult Indigenous peoples. The Mining Law was crucial in articulating land dispossession for the sake of extractive development. The five strategic projects for gold and copper mega-mining- three in the highlands and two in Amazonia- contaminated rivers and fueled conflict. Lawfare was key to protect foreign investments in extractive industries, and criminalization was harsher against nature defenders. The Water Law and the Land Law confirmed a massive land grab orchestrated by the Citizen Revolution. The first authorized the commodification of water, enabling Nestlé to build its largest water-bottle plant in all Latin America in the foothills of the Cotopaxi. The second opened the land grab to foreign capital, permitted foreign capital to buy vast lands for industrial monoculture. These policies subjecting territories to foreign extractive industries were accompanied by a racist rhetoric. In addition to using legal warfare, President Correa treated Indigenous authorities as savages, caveman, violent, terrorists, and retarded during his national broadcasts. For most Indigenous communities, the Revolution was not associated with their understandings of sumak kawsay (living well), but with violent dispossession, further exclusion, and toxic contamination. There is little to celebrate from Ecuador’s pinktide. A first desolating conclusion is that the authoritarian turn has legitimized voices on the political Right, which became defender of basic human rights gaining the electoral support of various Indigenous leaders. A second one is that the Left has not achieved the inequality reduction it has claimed. Worst, it has devastated the system of welfare and left the country economically broken. A third one, is that the Left relied on extractive models of development that accentuated colonial dynamics of dispossession. The Citizen Revolution strengthened the state at the detriment of the public, and its authoritarian hand is now considered the most repressive in the country’s history. Today, Correa is facing trial for crimes of state, and nobody dares identifying with the Left anymore.